Have you ever wonder which apps use a camera permission, which apps have Google ads?. This can be done by My APK pre-2.3.7.4 version but it takes time and not easy to use at all. My APK 2.3.7.5 brings a new way to make things better. - Advanced app/apk search: You can list all of the apps/apks which use a permission or has an activity. The most useful thing here is that you can combine the constraints to fit your need. 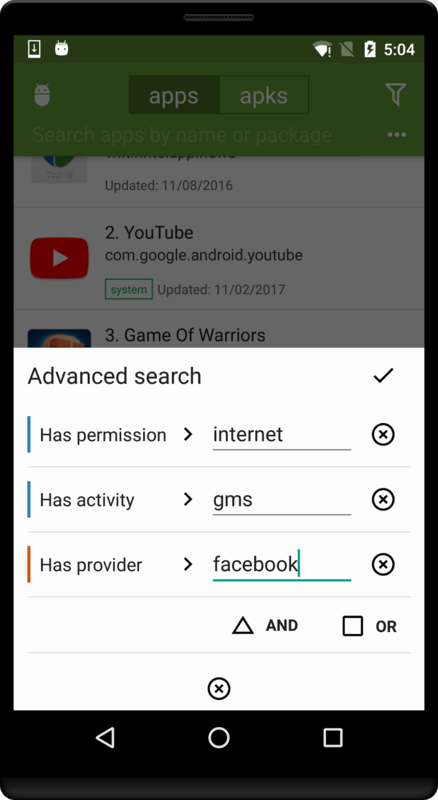 For example, in the picture above, it is a combination which will return all of the apps which has permission contain internet and has activity contains gms (notice the same color indicates that it is a group) or apps which have provider contains facebook.